Ill Crag is one of the peaks in the Scafell range, the third tallest after Scafell Pike and Scafell. Ill Crag is not normally included in the list of Lake District mountains over 3,000ft, although the Scottish Mountaineering Club does include it in the list of 'Furth Munros', or mountains in Britain but outside Scotland that would otherwise count as Munros. 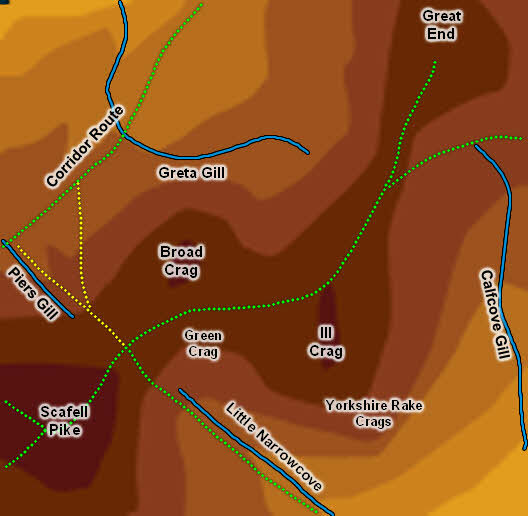 Personally I suspect that Ill Crag and Broad Crag are normally excluded not because they are close to Scafell Pike but because they are so close to each other. The smaller drop in the ridge is the one between Ill Crag and Broad Crag, although this still feels like a significant climb when one is walking along the ridge! Broad Crag to Scafell Pike definitely feels like you are passing from one fell to another, as does the climb from the top of Calf Cove onto Ill Crag. It probably doesn't help that the gap between Broad Crag and Ill Crag is hidden from many angles, so this part of the Scafell Range presents a uniform and very rocky front to the world. Ill Crag is connected to Broad Crag in the west and Great End in the east. The drop in the west is just under 190ft, that in the east around 250ft. Ill Crag is a long wedge of high ground, running north-south. It is lined with impressive crags in every direction, and the only easy approach routes are from the cols that connect the fell to Broad Crag in the west and Great End in the north. The large summit plateau contains some of the last rock-free ground to be encountered by the walker heading for Scafell Pike from Esk Hause and so the fell is fondly remembered (at least by me) later in the walk when boulders have taken over. Despite being so close to popular routes Ill Crag lacks any clear path to its summit. The only practical lines of approach are from the path that leads along the ridge from Calf Cove to Scafell Pike - once you've reached the top of the plateau above Calf Cove branch off to the left and head towards the highest point at the southern side of the plateau (this is perhaps best not done in fog). Two of our walks cross the Ill Crag plateau - Scafell Pike via Sty Head and Scafell Pike from Great Langdale. In both cases the summit can easily be visited by a short diversion to the south. Ill Crag has a large rocky summit plateau, with the top of the fell at its southern edge. A ridge of higher rocks run east-west across the plateau, with dramatic views down into Esk Dale. In the south Ill Crag is bordered by two clear streams - Little Narrowcove beck forms the boundary with Scafell Pike while Calfcove Gill splits the fell from Great End. Both run in the River Esk which runs along the base of Ill Crag's impressive southern cliffs. To the north Greta Gill runs across the northern face of the fell, again acting as the boundary with Great End. A number of small becks rise on the slopes of Ill Crag, with the longest running south to join the Esk at the same place as Little Narrowcove beck. Ill Crag has no tarns. Ill Crag and Broad Crag are probably the two fells that see the most people pass within a short distance of the summit without actually coming to the top.